Is a Sedum Burrito Plant Poisonous? How Do I Transplant Sedum Rosettes? Sedum is the workhorse of the garden, picking up the blooming cycle when other plants start slacking off. 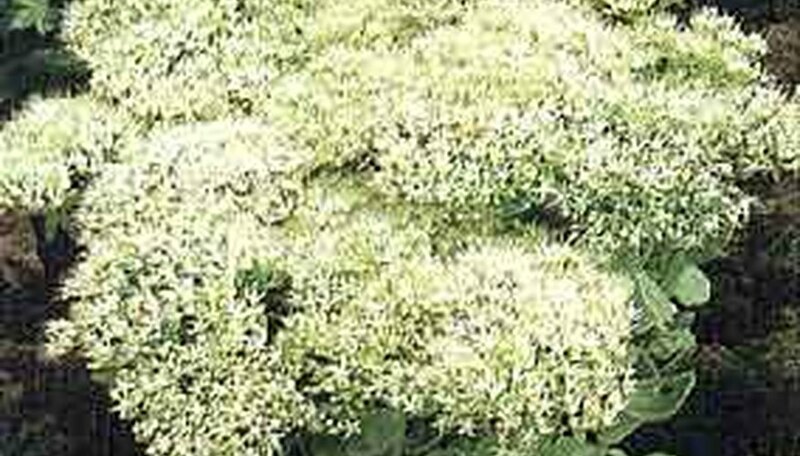 One of the main problems with sedum is that, because it is so hardy, it will just grow and grow and may become gangly. Overly large showy or tall sedum can be dug up and divided. If your sedum just needs a prune, that's a much easier project. Wait until early spring to cut back the sedum. Then, choose a cool day and plan to do the trimming around mid-day. Disinfect your hedging shears by combining one part of household bleach to nine parts of water in a tub or bucket large enough to accommodate the blades of the shears. Allow them to soak for two minutes, then remove them and clean the blades with soap and water. Cut back the sedum to 3 inches tall with your hedging shears. Start with the outside stems and work your way to the middle. Pinch off the tip of new stems when they reach 4 inches to keep your sedum looking tidy. This will encourage the plant to grow bushier instead of growing more stems from the crown. Prepare the new planting location before lifting the plants from the ground. Pull all grass and weeds and remove any rocks large enough to interfere with planting. Dig the sedum plant carefully with a garden spade. Do not disturb the soil next to the stem; instead, begin loosening the soil several inches from the base to avoid damaging the root system. Gradually loosen the soil until the plant can be easily lifted. Shake the sedum gently to remove excess soil and dead growth. Use your fingers or a sharp knife to separate the roots into three to five small clusters. Examine the sedum and dispose of any parts that look weak, as well as the woody center of the plant. Plant the newly divided sedum roots at the same depth that they were previously growing. Water until the soil is thoroughly moistened, but not soggy. Water the new plantings whenever the top inch of soil no longer sticks to your finger. Sedum have small, fleshy evergreen or semievergreen leaves in a variety of sizes, shapes and colors. Their starlike flowers bloom at intervals throughout the year depending on the species and the location. Sedums are suitable plants for rock gardens and flower borders; those with trailing stems will cascade from hanging baskets. 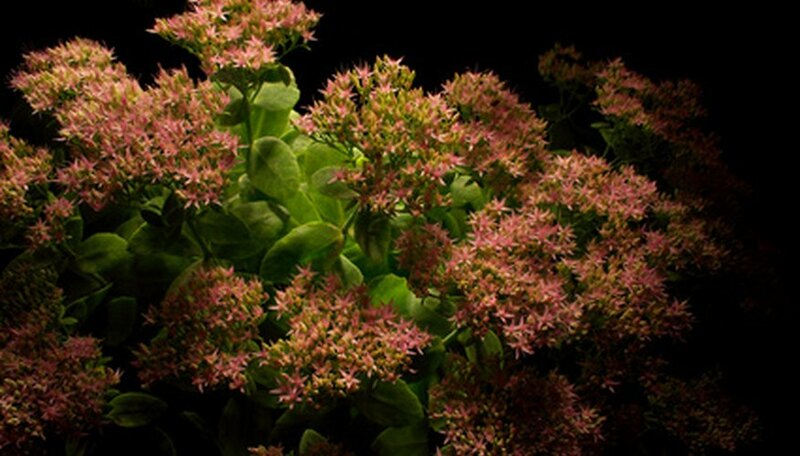 Sedums grow well indoors where they get four hours or more a day of direct sunlight, or from 12 to 16 hours of strong artificial light; they grow fairly well in bright indirect light. In spring, summer and fall, night temperatures of 50° to 65° and day temperatures of 68° to 90° are suitable. In winter, give them night temperatures of 40° to 50° and day temperatures up to 65°. Let the soil become dry to the touch between thorough waterings; for plants that become semidormant during the winter, such as showy stonecrop and October plant, water only enough to keep the leaves from shriveling during this period. Feed established plants three times a year--in very early spring, late spring and late summer, using a house-plant fertilizer such as 10-20-10 at half the strength recommended on the label. Do not feed plants the rest of the year. Trailing plants rarely need repotting. Because the stems of burro's tail are so brittle, it is better to feed and water old, crowded plants more often than attempt to repot them. When repotting of any sedum is necessary, use a mixture of 1 part commercial potting soil and 1 part sharp sand. Add 1 tablespoon of ground limestone and 1 tablespoon of bone meal to each gallon of mix. Propagate in any season from cuttings or by dividing plants. Outdoors, white stonecrop, October plant, and shoy stonecrop can be grown in Zones 3-10 except on the Gulf Coast. Most other sedums grow well outdoors in Zones 9 and 10. All need full sun or light shade. Most tolerate almost any well-drained soil, adapting to poor soil and dry locations; the exception is burro's tail, which needs protection from wind and rain. Plant at any time when the soil can be prepared, placing plants 9 to 12 inches apart. Do not fertilize. Fill a 3- to 4-inch container with commercial potting soil for cactus. Dampen the potting soil with a spray bottle until the soil is just barely moist. Like all succulents, sedum spurium will rot quickly in soggy soil. Cut a leaf from a healthy sedum spurium plant, along with a 1- to 2-inch stem. Set the leaf aside for one to two days, or until the cut end of the stem dries out and develops a callus. Plant the leaf in the potting soil, with most of the stem buried but the leaf above the soil. Tamp the soil lightly around the stem. Place the container in filtered sunlight such as a shady window or a window covered by a sheer curtain. Place the container in filtered sunlight, such as a shady window or a window covered by a sheer curtain. Mist the potting soil lightly when the soil feels dry to the touch. Plant the sedum spurium outdoors when the roots are at least an inch long. Wash a small plant pot with hot soapy water. Rinse with a mixture of one part bleach and nine parts water to disinfect it. This will kill any germs, pests or diseases. Mix equal parts of potting soil with sand. Mix well to distribute the sand among the potting soil. This will create a good draining soil mixture. Fill your plant pot with your soil mixture. Tap it on the bottom to help the soil mixture to settle. Cut a branch of sedum about 2 to 3 inches long with a sharp knife. Choose a section that is not damaged, infested with insects or diseased. Make a hole in the center of the potting soil with the eraser end of a clean pencil. Push your sedum cutting into the hole. Gently push the soil up around the cutting to hold it in place. Do not water the cutting for 1 week. Place the cutting in an area with indirect light. Check for roots after 4 weeks. Gently lift up the cutting. If it offers resistance then it has grown roots. Several species within the Sedum genus are listed as being poisonous with Sedum acre, or biting stonecrop, being a common poisonous species. Sedum burrito is not listed as a poisonous variety, however. Look for ground cover sedums growing in USDA hardiness zones 3 through 9 on rocky, dry or nutritionally poor soils in a full sun exposure. Identify trailing sedum by its deep green, spoon-shaped leaves in spring and summer and a bronze to golden cast in fall and winter. The plants will form small colonies or mounds that do not exceed 3 to 4 inches in height. The narrow green leaves are snug with one another on the trialing stems and have a medium to fine succulent texture and a slight sheen. Check to see if the plant has compact, slightly limp or flexible trailing plant tips that are slightly tapered and covered in a dense coat of leaves. The tips of trailing sedum will point up towards the sun at their terminus. Pick out trailing sedum by the small, yellow to orange, vaguely star-shaped flowers arranged in clusters that appear on the plant in spring. Identify the seed fruit of trailing sedum by its deep red hue and persistence on the plant in fall and winter. Choose a site that has full sun to partial shade and good drainage. Dig a hole slightly larger than the root ball of your yellow sedum plant. Place the yellow sedum in the hole, backfill with dirt and tamp down firmly to remove air pockets. Water well, then water no more than once a week until the plant is established. Sedums are extremely drought tolerant and really prefer a bit of neglect. Examine the plant and note the characteristics of the leaves. All sedums have thick, succulent-like, waxy leaves. Check for the plant’s bloom time. Though flower varieties vary, all sedums bloom in late summer and early fall. Take a photograph of your plant using a digital camera with a macro feature. Compare your photograph with examples posted online at sedum websites such as the Sedum Society at www.cactus-mall.com. Take a cutting of the plant for further identification by snipping off a segment of the plant with garden shears. One of the services that the Sedum Society offers is to identify your plant if you send it a cutting. Borrow a book specific to the subject of sedums from your local library or purchase one from a book store. According to Ray Stephenson, author of "Sedum: Cultivated Stonecrop," most general garden books neglect the subject of sedums. If your library does not have a book on sedums, you can borrow one through inter-library loan. Snap or cut the sedum rosette off of the parent plant, leaving roughly 1 or 2 inches of stem attached below the rosette. Wet the cut end of the stem with water and dip into rooting hormone powder to help encourage fast root development. Fill a nursery pot four-fifths of the way up with a sterile, lightweight and slightly alkaline potting medium, firming it gently. Create a hole in the soil with a pencil to accept the stem cutting. Slide the hormone-covered stem cutting into the soil and firm the soil around the stem. Water in gently to make the surrounding soil evenly moist but not soaking wet. Keep the soil evenly moist until the sedum is well rooted in the pot. Cultivate the soil for the creeping sedum. If the planting area is large, use the garden spade to loosen the soil down to a depth of approximately 3 inches. If the planting area is small, use the hand spade to loosen the soil gently. Dig shallow holes for the sedum. Space the plants 3 to 4 inches apart and make the holes only deep enough to accommodate the roots. Place the sedum plants in the prepared holes, spreading out the roots gently. Cover the roots with a small amount of soil; however this step is not mandatory, as creeping sedum will establish itself and grow into the soil with very little assistance. Provide a light watering immediately after planting the creeping sedum.